Faster broadband speeds and accomplished routers have changed the way in which web content is streamed across the home. Pair a 100Mbit Internet connection to an 802.11ac router and you have the best of both worlds: blazing Ethernet-connected performance and WiFi that is stronger and faster than ever before. Such a situation is great when accessing the web via a gaggle of mobile and AV devices but falls short if your Internet-connected equipment doesn't have baked-in WiFi. And what happens when that 802.11ac WiFi isn't potent enough to reach every corner of your home? Drop-outs and buffering, that's what. Powerline has been a go-to solution for users whose needs extend beyond WiFi. Usually connected to the router at one end via Ethernet and then spreading data usage by riding over the electricity and through plugs on the other, Powerline gives wired-like performance without the clutter associated with running multiple cables around the home. The technology has evolved to offer higher speeds and multiple ports. Say your router is upstairs, by the main PC, but you need to connect an older TV, Blu-ray player and media centre PC to the Internet. A multiple-port Powerline kit is just the ticket. Serving the ever-expanding needs of the modern home, Powerline manufacturers are pushing higher-priced kits that offer multiple ports and a means for bridging WiFi. The TP-Link AV500 Powerline ac Wi-Fi Kit (TL-WPA4530 KIT) is a prime example, providing a potential 500Mbps throughput and a three-port receiving unit. What's clever here is that the two units also provide a secure wireless link at the same time, and can use this link to clone your existing wireless connection and extend it farther. The base adapter, on the right, featuring two ports, is designed to plug into your router and also offer an additional hardwired connection. 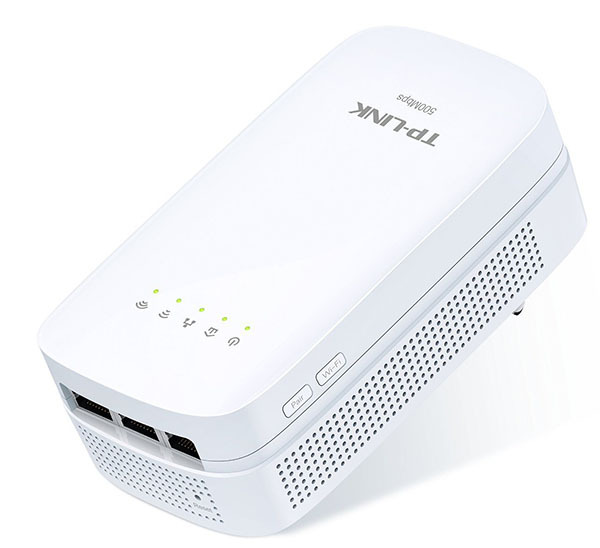 Good design means that, for most plug sockets, the two ports face upwards, making it easy to attach network cables, and TP-Link supplies a couple in the box. At 100mm tall and 40mm thick, it won't foul the adjacent wall-mounted socket, and the pass-through ensures you don't lose a plug by adding the TL-PA4020P to your networking infrastructure. This Powerline adapter is also sold separately and as part of other bundled kits. The other part of the reviewed £70 kit is best described as a Powerline WiFi extender. 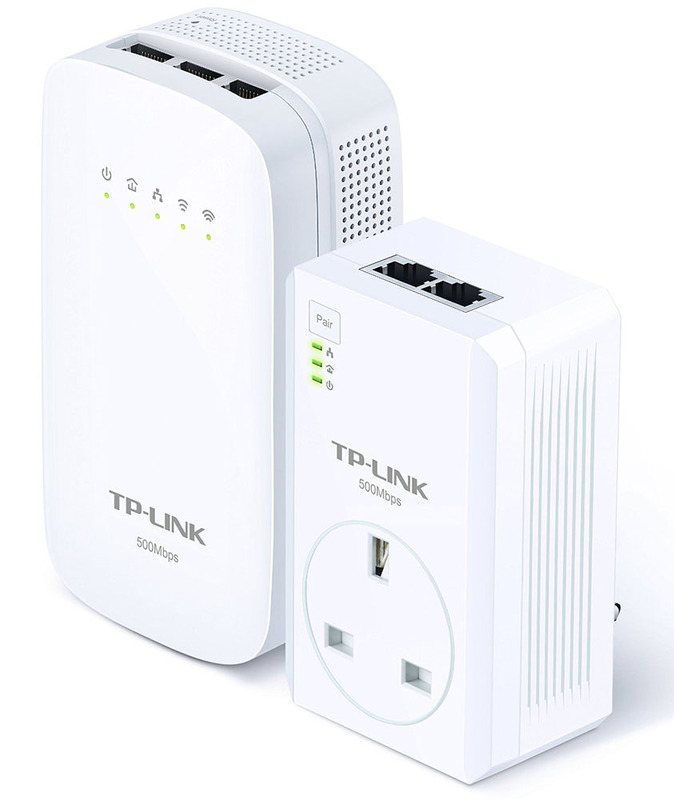 It provides the usual networking-over-mains common to all Powerline kits, but its main trick is to offer extra functionality through three Ethernet ports on the bottom and dual-band wireless bridging capability for getting the WiFi signal into those hard-to-reach places. At 130mm tall and 70mm wide, its size stops you from adding another plug directly alongside, and you also lose any pass-through ability available on similar units. Perhaps a better way of understanding it is to think that this is an 802.11ac WiFi bridge that also has Powerline capabilities. Standalone WiFi bridges with multi-port Ethernet typically cost as much as this entire kit, however. It shouldn't take even a networking novice any more than five minutes to have the kit up and running. Attach a cable from the router to the base adapter, literally plug in the larger adapter near the area where you'd like multiple connections - somewhere near the TV always works. Press the 'Pair' button on the base adapter until the power LED starts blinking, and within two minutes do the same for the larger recipient adapter. Five LEDs can become annoying if using it in a bedroom, so TP-Link adds an LED-off button on the far side. The real point of this kit to provide additional WiFi capability, otherwise a simple two-plug Powerline kit would suffice. Assuming your router has a WPS function that has been activated, there's a two-minute window in which to press the small WiFi button on the WPA4530. Doing so copies the router's login settings for both 2.4GHz and 5GHz bands, acting as an extender should the WiFi signal be otherwise weak. TP-Link says this part of the kit supports up to 300Mbps on the 2.4GHz band and 433Mbps on the 5GHz, or plenty fast enough for most routers.